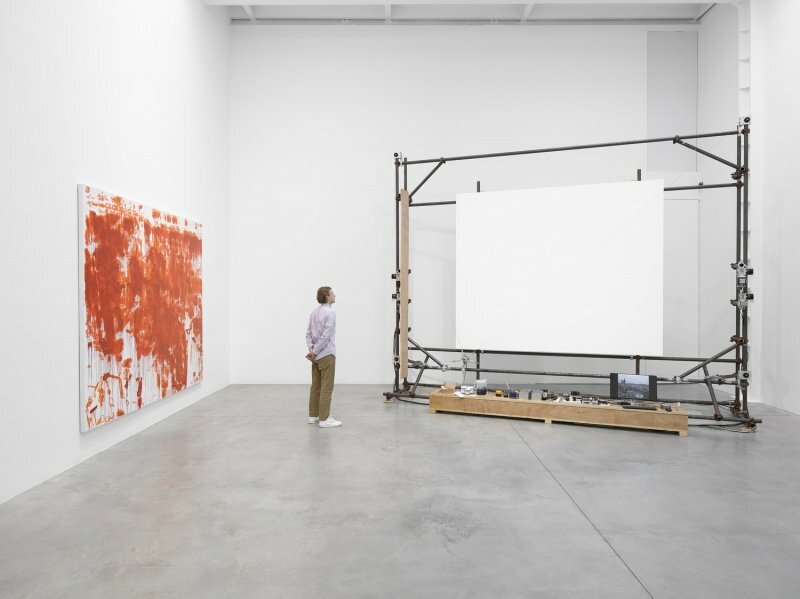 Installation view of Liu Xiaodong: Weight of Insomnia at Lisson Gallery, London, 25 January – 3 March 2019. © Liu Xiaaodong; Courtesy Lisson Gallery. , 98 3/8 x 118 1/8 in © Liu Xiaodong. Courtesy Lisson Gallery. Liu Xiaodong, Into Taihu, 2010. Oil on canvas, 300 x 400 cm / 118 x 157 1/2 in. Chinese artist Liu Xiaodong is a paradox: venerable CAFA professor linking arms with the algorithm, adherent of real life and advocate of robots, an expounder of sadness with a mischievous sense of humour. We spoke to him in London at the opening of his new show to help us solve the Liu Xiaodong equation. Liu juggled semantics when choosing the title of his robot-executed paintings. He had originally been attracted by the idea of Weight of Sadness. Reflecting that sadness is difficult to objectively measure and assess. Instead, he opted for insomnia, with its tang of lonely, sleepless pallor. This is an artist who revels in real life and its sorrow. He embodies what one Danish curator I spoke to termed “an immediate humanity.” And yet, he is drawn both to photography, and to replacing himself with a robot. Perhaps change, evolution, obsolescence are core aspects of the human narrative. The trace of time is a key theme in this solo exhibition at the Lisson Gallery in London. Time is the title of the only non-robot created work here, a painting addressing South Korea’s 1980 student uprising, where 165 students were killed at what is now called 18 May Democracy Square. Time is a figurative painting of immediate and sinister impact: children of the protesters understudying for their parents on that fateful square, the shade of a protester lying stage right. 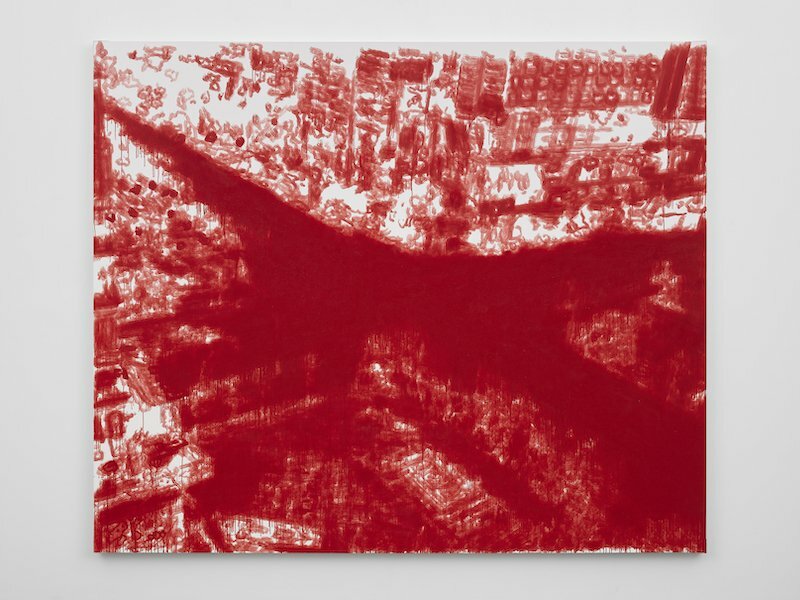 Liu portrays the same place in the adjacent painting from the Weight of Insomnia series, the algorithmic portrayal of the square in visceral, bloody red. As the buzzing continues, the robot is only just getting started on several weeks of observing Trafalgar Square. The result will be one painting which portrays more than a month of human activity. How will that month-long period leave its traces on the canvas? On closer inspection, each Weight of Insomnia painting has an unexpected visitation through the ether. There are shapes that appear which seem unconnected to the corresponding video footage. Strange bodies rise up, lines of connection emerge with no apparent counterpoint in the real world. Are these traces of human energy, ghosts in the machine, or mere mistakes in the algorithm? What has the robot seen, in its days of constant vigil that has escaped the human observer? Perhaps, this is Liu Xiaodong’s last paradox: robots solving the equation of humanity plus time. Our conversation with the artist follows. 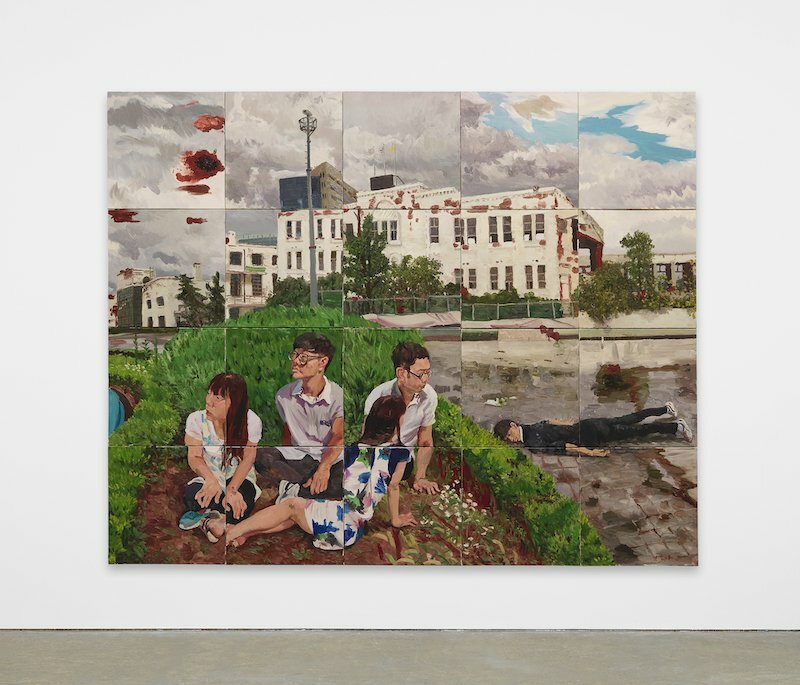 Liu Xiaodong, Weight of Insomnia has captured scenes in diverse cities including Shanghai, Berlin and Sydney. How will London be different? Every city has its own smell, its own flavour. London will probably be more profound, I deliberately chose a dark shade of blue. What feelings do you hope the machine will inspire in your audience? I wanted the audience to enjoy more the process of painting, to feel a little surprised every day. 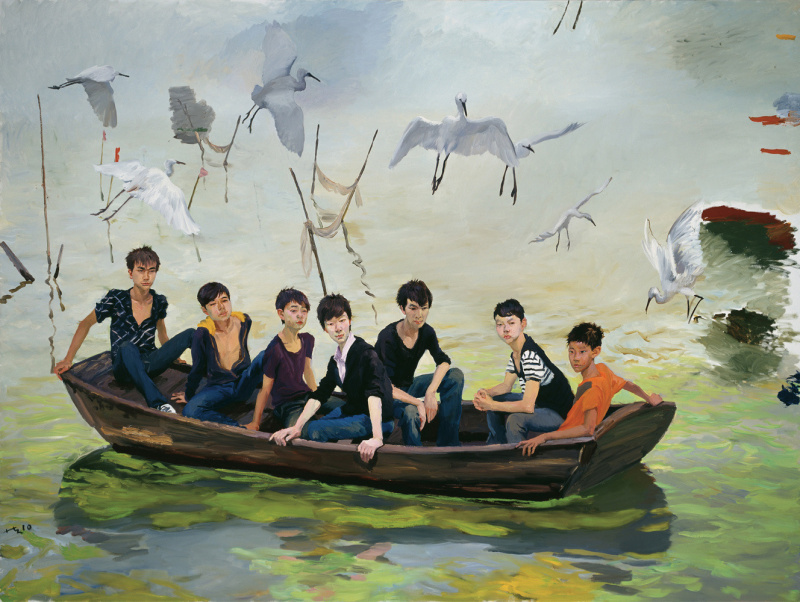 When you painted boys in a boat on a lake in Wuxi (Into Taihu – 2010) you said that a beautiful environment can bring out feelings of loneliness. What happens when the machine paints the city? Cities are extremely complex, there are simply too many cars, people, buildings; the machine depicts the city in a way that I am unable to through my hand painting, it is scrupulous in every detail, it is absolutely appropriate for depicting cities. If machines can take over some of the physical labour of painting, what will artists do with the extra time? In this extra time, I sit as if in trance and I ponder over the reason why I make art. If this reason is good enough then the machine will not surpass the power of my art. How would you summarize the meaning of time in this exhibition? In both this work, as well as in the other works, it’s time that forms and shapes the different appearances of the paintings. You have said that the world is becoming more standardized. How should artists respond? There is ever more need for the freedom of the arts to break through this ever more standardized world. What are you planning for the rest of this year, 2019? In the next few years, I plan to hand-paint some villages in the mountains of China, as well as the American and Mexican border, and some young wealthy Chinese that have chosen to live in London.